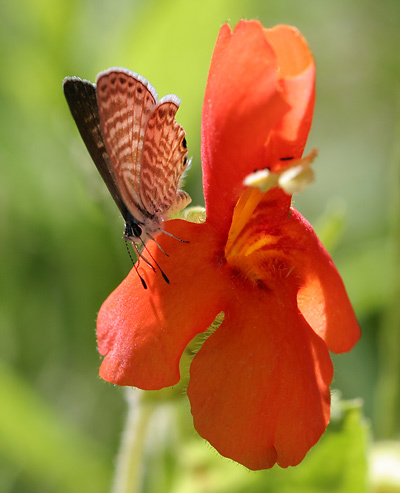 I observed this Marine Blue (Leptotes marina) butterfly on a Scarlet Monkeyflower (Mimulus cardinalis) in July of 2005 in the Santa Catalina Mountains near Tucson, Arizona. Of all of the butterflies, Blues (Subfamily: Polyommatinae) are some of the most frustrating to photograph. These lovely little butterflies usually have beautiful powdery metallic blue dorsal wing surfaces which can be seen gleaming in the sunlight when they are flying, but these butterflies close their wings upon landing, showing only their often duller and browner ventral wing surfaces. Fortunately, identification of these butterflies is easiest by observing their drab, but usually more distinctively patterned ventral wing surfaces. This butterfly can be identified as a Marine Blue by the narrow cream and broader brown bands on its ventral wing surfaces and the two small eye-spots on the hindwings. The upper (dorsal) wing surfaces differ on the males and females. Female Marine Blues have small areas of light blue near the body on their mostly brownish dorsal wing surfaces, while the much more colorful males have blue-violet dorsal wing surfaces. Marine Blue butterfly larvae feed on Doctorbush (Plumbago scandens) and plants in the Pea Family (Fabaceae).